Are you looking to save money on your utility bills? Or maybe you are looking for a little wiggle room in your budget and aren’t sure how to find it. 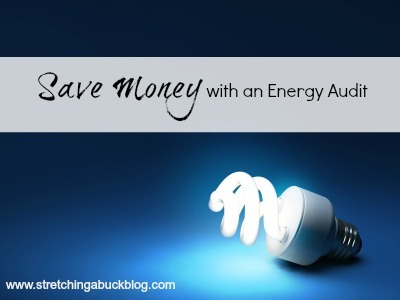 Did you know that a home energy audit could save you a significant amount of money over time? I know that I didn’t realize how much until I started reading more about it. Home energy audits assess how much energy your home currently uses and provide you with more information about how you can make your home as energy efficient as possible. The more efficient your home, the less money you are going to pay on your monthly energy bills over time. Recently my friend Kristy decided to call her local electric company to see if they performed audits and was pleasantly surprised to find that because she pays her electric bill on time, she qualified for a free audit. A representative from her local electric company came to her home and spent about 3 hours evaluating her home and giving her tips on what she could improve. As an added bonus he also brought her 48 CFL’s for FREE. I didn’t rate quite so well when I called my local provider, AEP…they don’t offer energy audits and could only refer me to companies that do. If this is something you might be interested in, call your local provider to see if they offer an energy audit program. Maybe you’ll luck out like Kristy did! I think my husband and I are going to go the DIY route and conduct our own audit. What about you? Have you either done this yourself or paid to have it done? Did you notice a drop in your utility bills after making a few changes to improve the efficiency of your home? This makes sense to me. You wouldn’t you leave a window or door open and hope that your home stays cool/warm. So it follows that cracks around your windows or an poorly insulated wall would lead to lots of energy waste. If your local utility company doesn’t perform free audits, I believe air sealing and insulation companies provide the service free, too. Previous post: Free Bottle of Suave!